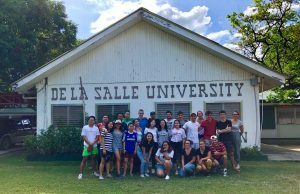 As part of the requirements for the Ecology course, 11 out of 13 students from UniLaSalle, a La Sallian University in France, and all 13 students from the BS Human Biology, BS Biology and BSEd Major in Biology programs of DLSU spent their field trip at the Br. Alfred Shields FSC Marine Station in Lian, Batangas last November 10-11, 2018. 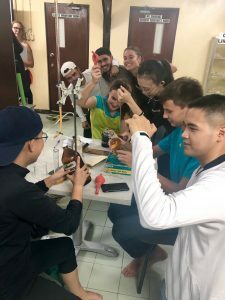 The students performed laboratory techniques learned in their lab classes in testing the water quality of one of the freshwater streams connected to Talim Bay. 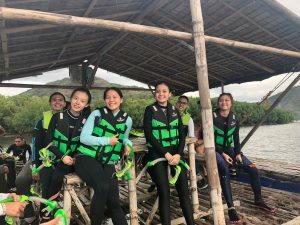 They were also able to appreciate the rich marine biodiversity of the area through a guided snorkeling activity of the nearby coral reef with the Lian Fisherfolk Association (LFA), a fisher community fostered by DLSU’s COSCA. Members of the class also went on an early morning hike up Mt. Tikbalang where they saw the interconnectivity of the upland and marine ecosystems of the area. Finally, the class together with COSCA facilitators, Leo Tadeña, Annadel Sapugay and Roel Quenamot, experienced a focused group discussion (FGD) with a new fisher community organization called SAMLOK (Samahan ng mga Mangingisda sa Sulok) to learn more about the socio-economic situation of our fishermen and help in the creation of sustainable development plans for the area. The faculty organizers for the trip were Dr. Wilfredo Licuanan and Dr. Chona Camille Abeledo of the Biology Department. They were assisted by Ysa Mendoza and Princess Zyrlyn Mordeno of the SHORE Center.